Did you know Harimoto has a younger sister that plays Table Tennis! The inspiring story of the man who plays table tennis using his mouth! Ma Long - Best Points of 2017 Enjoy! Here's my tribute video with the best points of 2016, hope you'll like it. 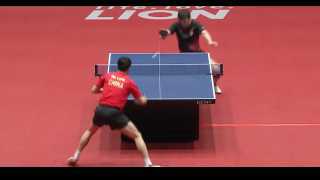 Amazing tribute about Zhang JiKe in Rio 2016 In passing, what's the name of the 2 songs please ? Ding Ning - and the Siberian Fox - look - alike ; see Google images .